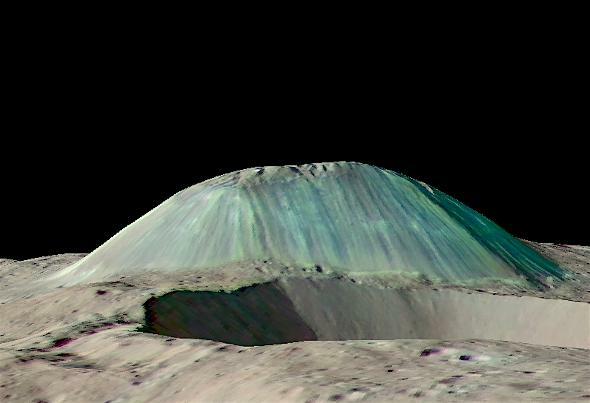 Ahuna Mons is likely a cryovolcano on Ceres. Ahuna Mons stands tall over Ceres in this view from the Dawn spacecraft. The colors are enhanced; it would appear gray to the eye. It’s hard to pick the one weirdest thing about Ceres. It’s the largest object in the asteroid belt between Mars and Jupiter. Most of the billions of chunks of debris in the belt really are leftover rubble from the early solar system, but some grew larger by the power of their own gravity, drawing more material in. As it happened, Ceres was well on its way to becoming a planet before it ran out of material to feed on. Bigger than an asteroid, but smaller than a planet, scientists call it a protoplanet. Out past Mars, the early solar system had lots of ice, and Ceres trapped this material as well. Its surface is dotted with white spots, what are now thought to be salt deposits left over as briny water leaked to the protoplanet’s surface and sublimated away. The surface is heavily cratered, of course, and hilly. But one features stands out … and I do mean literally. Ahuna Mons is the lone true mountain on Ceres, and it’s far and away the tallest: It towers an amazing 4 kilometers over the surface, and is 18 km across at its base. Nothing else on Ceres even comes close to it. But Ceres doesn’t have tectonics like Earth does. So what could possibly create such a huge feature? Ahuna Mons from above shows it to be a flat-topped mountain. We know salty water is oozing up to the surface because we see those shiny spots. Most of the spots are small, indicating low flow. But apparently that’s not the case for Ahuna Mons. New research just released analyzed data from the Dawn spacecraft, which has been orbiting Ceres since March 2015. There must have been a lot of salty water under the surface at the location of Ahuna Mons, and it kept pushing its way up and out. Mixing with the rock and dust of Ceres, it piled up over time, forming the mountain out of muddy brine. On Earth, when material flows out of the interior and forms a mountain, we call that mountain a volcano. But on Ceres, the material isn’t lava, it’s ice. So, Ahuna Mons isn’t just a volcano. It’s a cryovolcano. We know of several objects in the solar system with cryovolcanism, including moons of the outer planets, and even Pluto. And this gives us another piece of the puzzle that is Ceres. 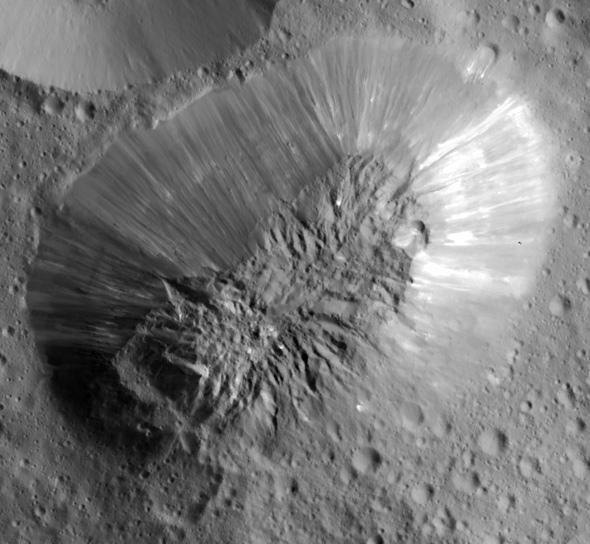 Clearly, ice plays a role locally in the surface of Ceres. However, another bit of research shows that its role is less important over long stretches of terrain. While the surface of Ceres is loaded with craters, it seems to have a deficit of truly big craters; several are expected to have formed from impacts, but only a couple exist (and even those are faint and hard to trace). It looks like the crust of Ceres is weak on the large scale, so that material in big craters can flow around and erase them, but still relatively stiff on local scales, allowing smaller craters to exist. All of these data are clues to how Ceres formed, how it changed over time, and why it came to look and behave the way it does now. Astronomers and planetary scientists are like sleuths, mulling over the evidence to figure out whodunit. And how. We’ve only been studying Ceres up close for a year and a half, and look how amazing it is! I wonder what else we’ll find there as we hold our magnifying glass to it.